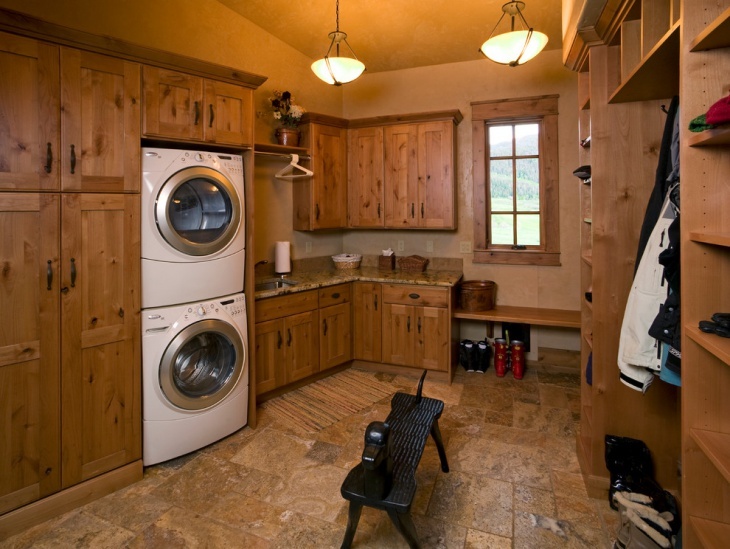 A laundry room is the place where you wash and dry your clothes. However there are other activities that happen there too. You fold your clothes or you iron, sometimes you let them soak or just hang them to air dry. This space should be functional but it also needs to be pleasant since you are going to spend time in it. 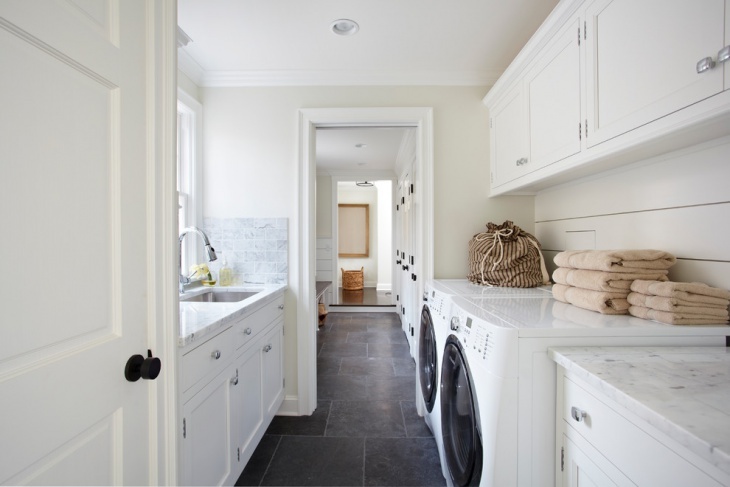 Today we picked 10 laundry renovation design ideas that might be of help. 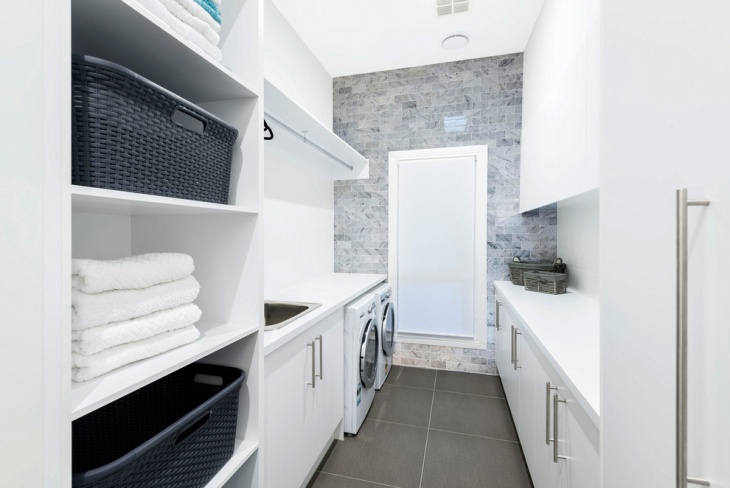 You can make a built in closet where you can put your laundry. 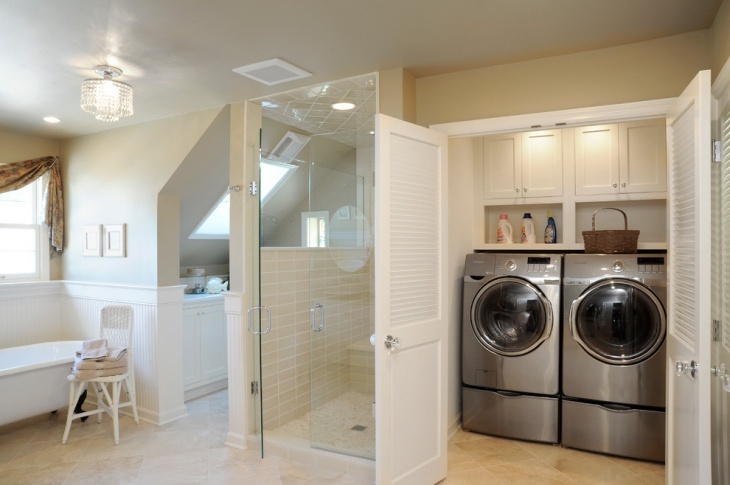 It will take less space from the room and you can always hide just by closing the doors. 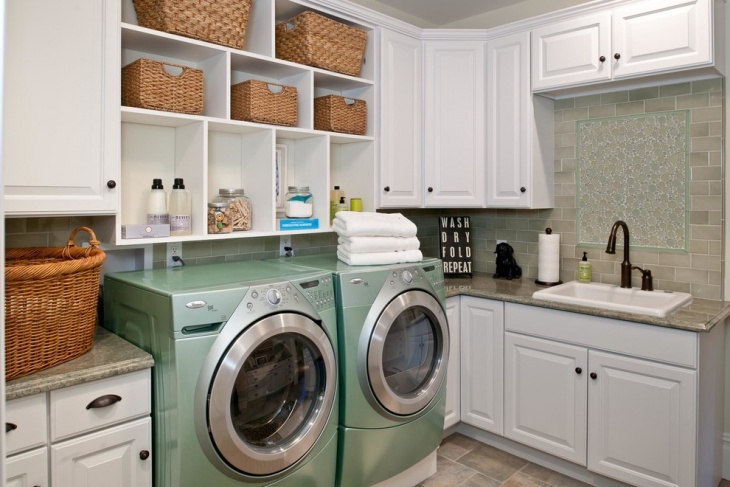 Make sure to built shelves and cupboards for detergents above the machines. 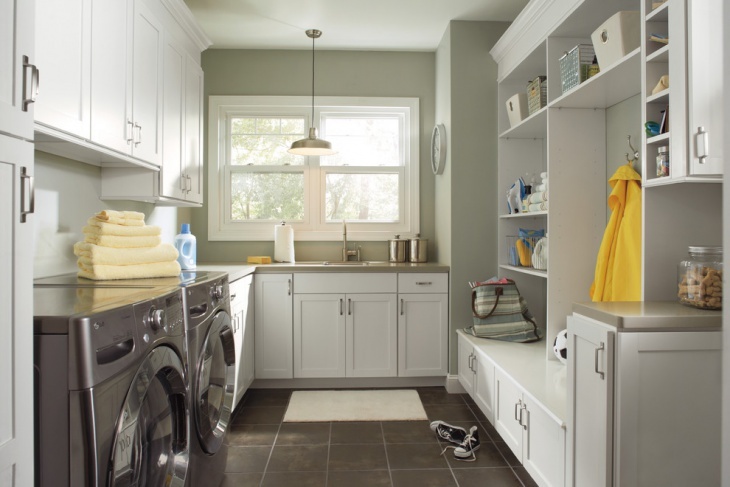 Install your laundry in the bathroom along with a couple cabinets above the washing machine. 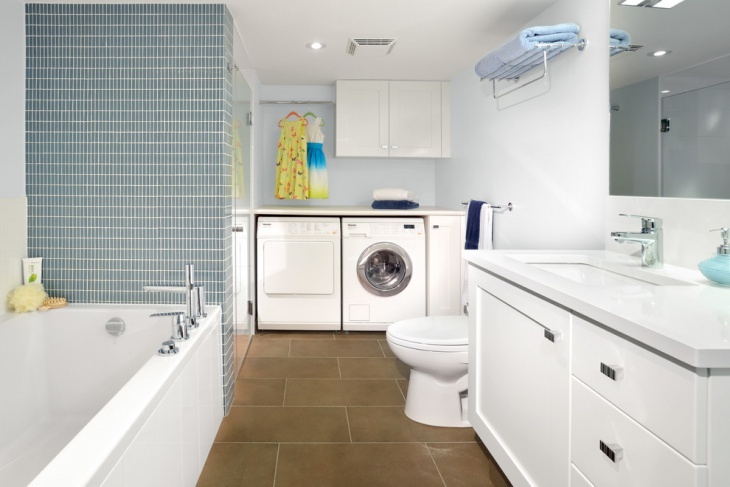 You can choose the machinery to match in color with the bathroom like the in the picture. 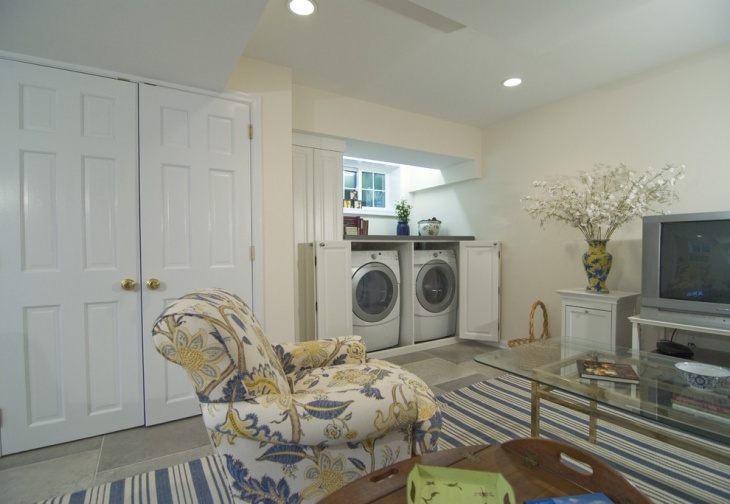 You can set your basement as your spacious laundry room. 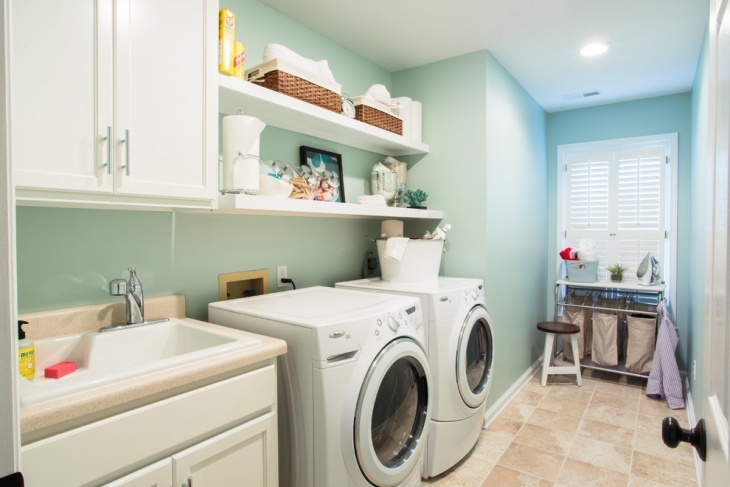 Design a useful space for both washing your clothes and relaxing while waiting for them to finish. 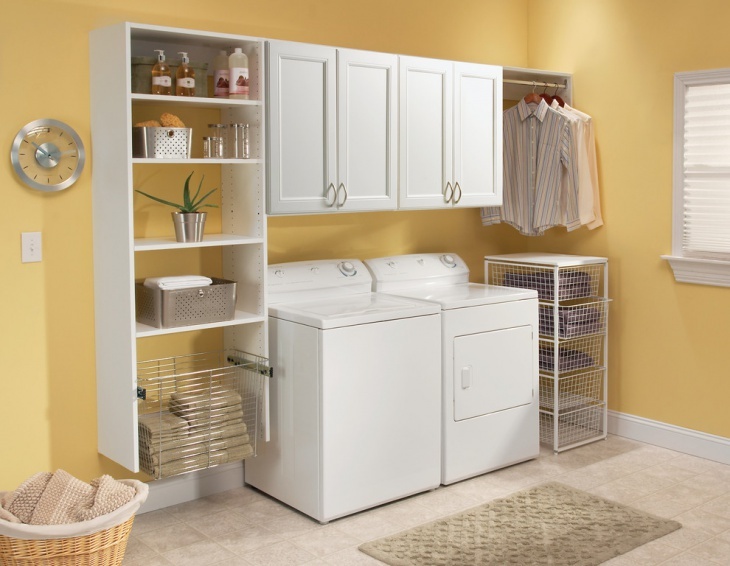 Take advantage of the space to build cabinets and closets for laundry storage and drying. This modern set up can be completed by adding a glass table with an interesting design. 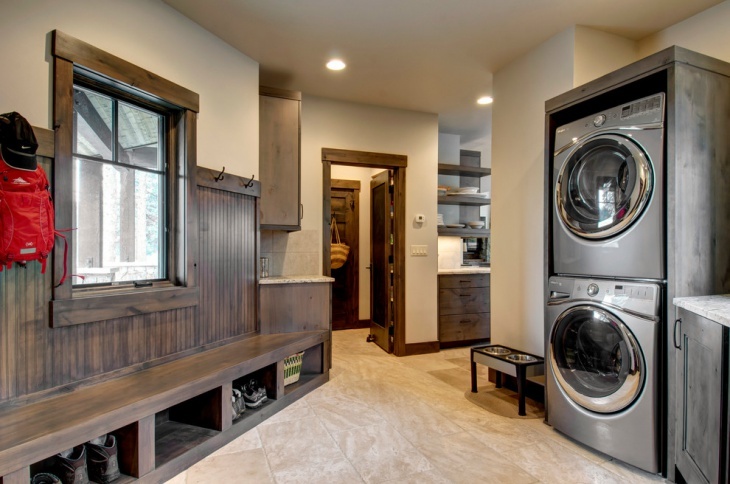 You can place your laundry in the mud room. The space that it will take will be less if the machinery is placed on top of each other, needing only adequate height in the room. 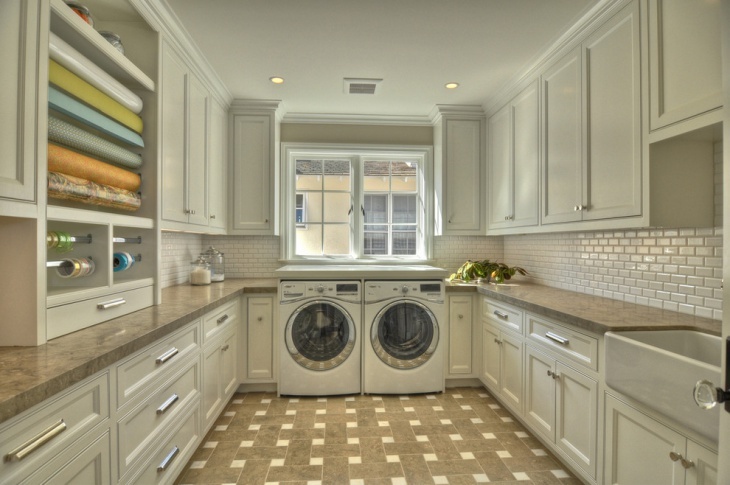 If you want to make a change in your laundry room you can just change the flooring. 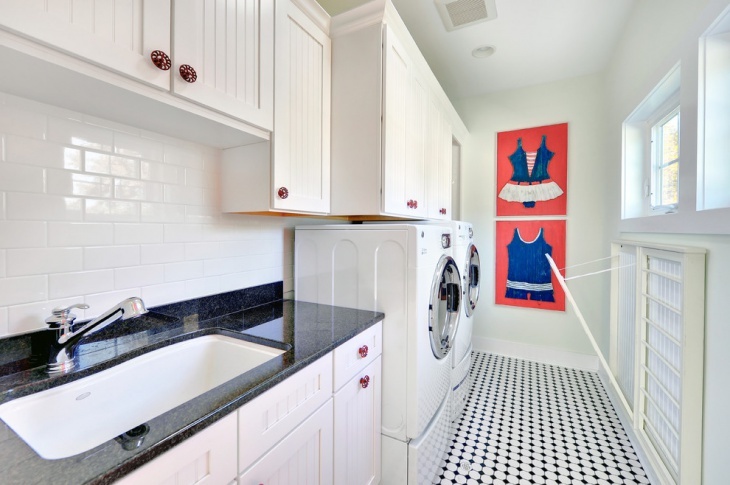 Use tiles in dark colors to set an antithesis with your white appliances. 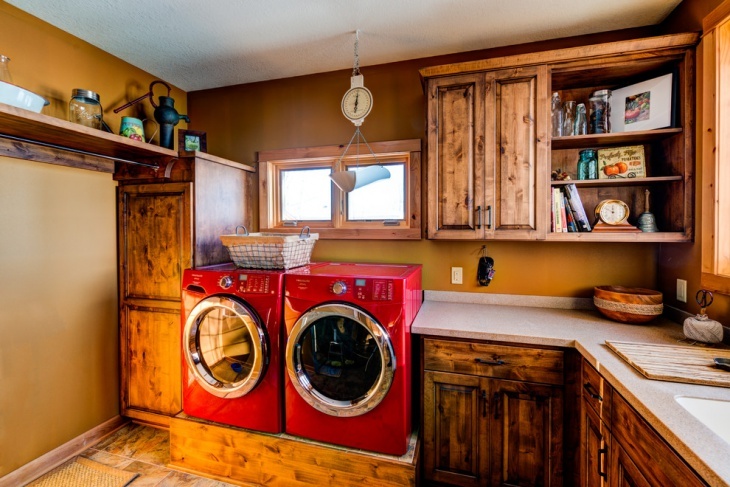 If you want to change the cabinets you can redo them in a white beach style. You can complete the room with a dark marble countertop and patterned flooring. 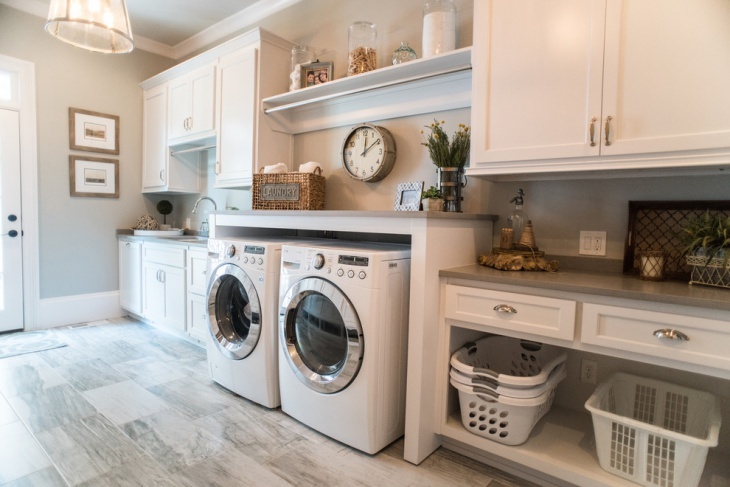 Like this transitional laundry room you can choose neutral colors to match the walls with the cabinetry and the countertops. Additional shelving will give you more storage space. 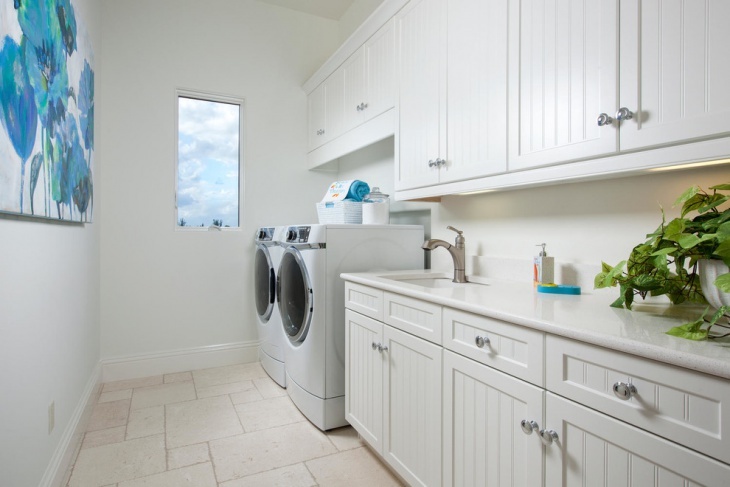 You can remodel your laundry room in white colors. You can always break the whiteness with a poster or some wall art in other colors giving a fresh point of view in this room. 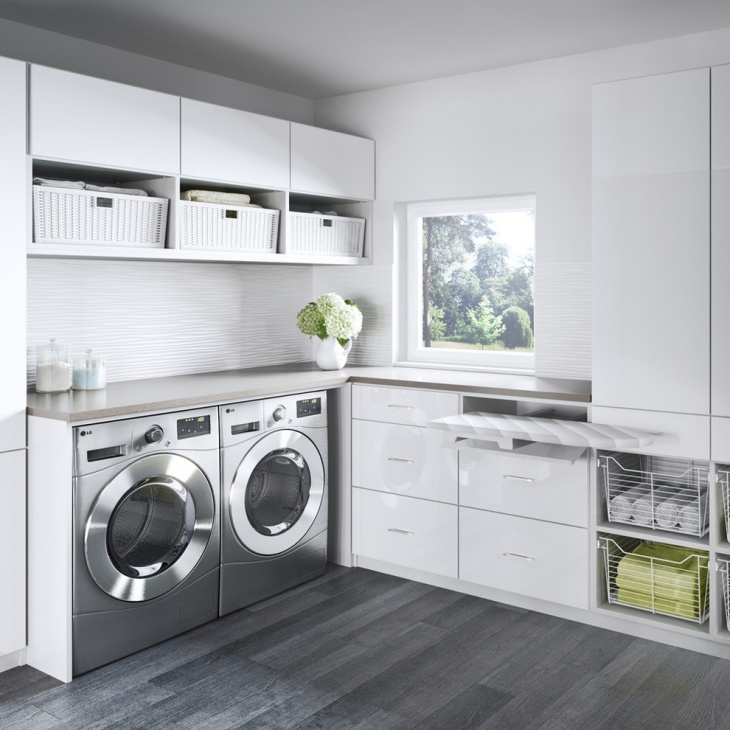 Laundry rooms need to be tidy and clean. Make sure that there is enough natural light in the room. If you don’t have large windows you can invest in hidden lighting under the cabinets. Organize the room according to your needs. This way you can arrange the room to a more practical layout that will work for you. The process of doing laundry can be boring. 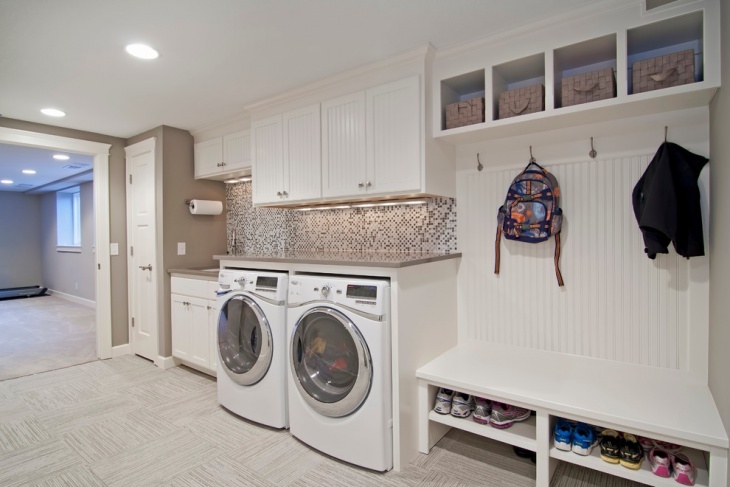 But an organized spacious laundry room can make the activity go by a lot smoother. Make your space pleasant. Arrange it and decorate it according to your style and preferences. Think about the things you do in your laundry and get creative.